What do you think of using traditional instruments samples recorded by one of the most prestigious orchestra in the world? By now it’s possible, for free. This not a slogan ads but it is true. Make Music is the name of a project developed by the Philharmonia Orchestra, which has recorded loop samples of traditional instruments freely available for all. A screen-shot of the Make Music page on the Philharmonia Orchestra website. This is a very interesting project, by one of the most important music orchestra. The Philharmonia Orchestra has excellent performers, a long history and was directed by many important conductors of the twentieth century, not just. 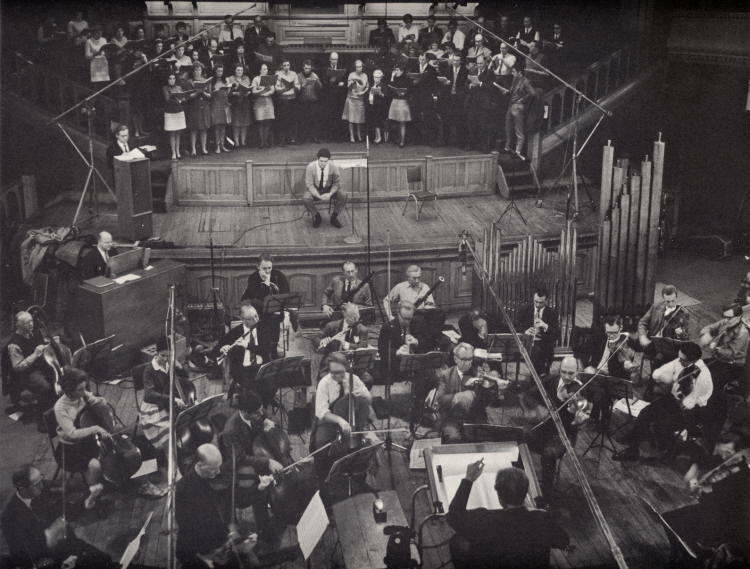 The Philharmonia Orchestra in 1967, directed by Otto Klemperer. The Philharmonia Orchestra was formed in 1945. His founder was Walter Legge, producer of the EMI label. The intention, initially, was to realize an official EMI orchestra. One can’t go on without mentioning at least some conductor of this orchestra over the years: Wilhelm Furtwängler and Arturo Toscanini first, then Richard Strauss, Herbert Von Karajan, Vladimir Ashkenazy, Giuseppe Sinopoli, Riccardo Muti, and many others. 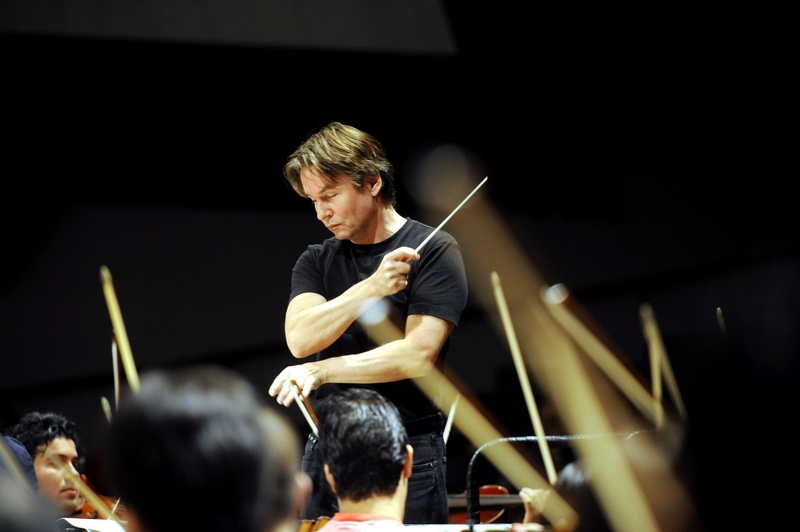 At present (October, 2013) the Principal Conductor is the Finnish Esa-Pekka Salonen. The conductor and composer Esa-Pekka Salonen with the Philharmonia Orchestra. It’s clear that some of the most important music personalities have risen on the Philharmonia’s dais. The history and quality of this orchestra is an added value for the Make Music project. Make Music is a collection of samples for all instruments of the Philharmonia Orchestra. It’s very interesting note that were made many recording for each instrument. 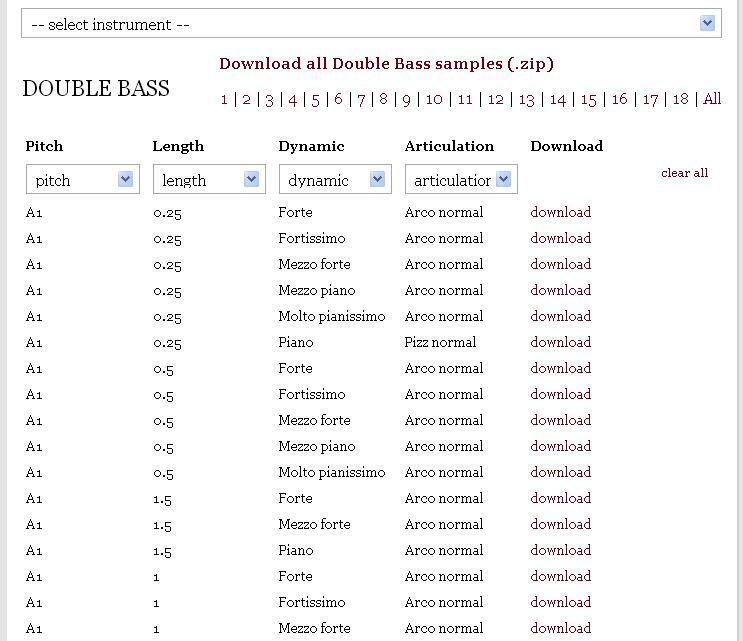 In fact, after selecting the instrument you can choose between numerous loop samples, split in according to pitch, length, articulation or dynamc. The picture shows the list of loop samples for each instrument. Clicking Download you can listen or download your choice. So, for any taste and any scope. Without limits. Recording materials are available for free under Creative-Commons 3.0 license. That is you can use these samples for a your new composition that you can sell. 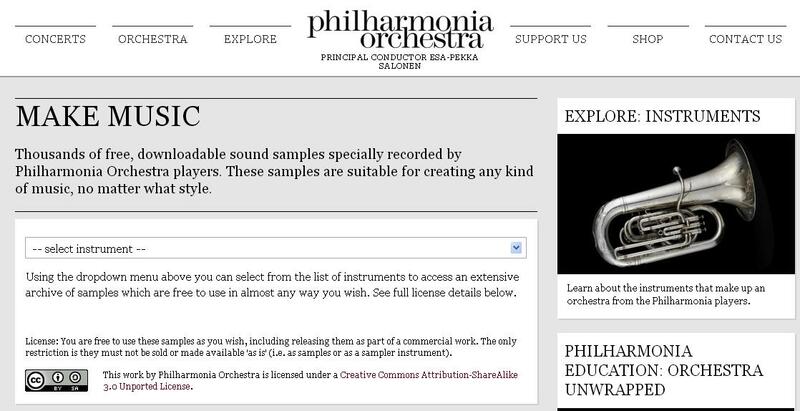 There is only one limit: isn’t possible to sell recordings of the Philharmonia Orchestra as sample libraries of a virtual instrument. What use we can do of these samples? This is the first question that I asked myself. First I think using these samples for a new song. Clearly adding effects, turning some knobs or pushing down a fader. Mmm, at this moment nothing interesting by me. Waiting for enlightenment. But, after rotating the third knob, I’ve had an idea: employ these recording for teaching goals, even utilizing the large amount of links that you can do with the history and the personalities of the Philharmonia Orchestra. Textual contents would not be few. Nevertheless, my intention was to use the philharmonia samples. So, i’ve got obtained a picture which describe the orchestra instruments and their disposition. Then I thought to link images with downloaded samples, to make a visual-sounding approach. Instruments are marked in Italian and English, so to learning other languages. Furthermore, if you upload this picture in your tablet, you can use it with children: they will be happy to touch colored circles to listening sounds (Sounds of Harp, Piano, and Vibraphone aren’t of the Make Music project). Aim of this item was to underline as it’s possible to find web resources very interesting to be used in contexts very different. The picture linked to Philharmonia samples is a first idea: I could have used many samples, or many images, I could have used real photos instead of graphic reproductions and so on. Maybe, next time.